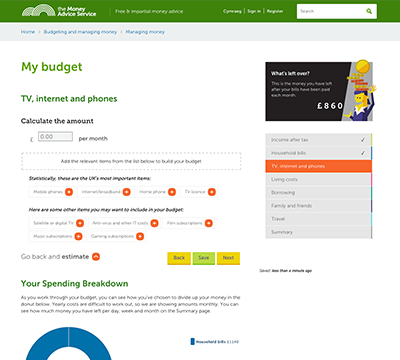 As well as editorial content, all of the Money Advice Service’s tools and calculators can be made available to your users, free of charge, to use on your websites. Below is a list of all of the available Money Advice Service tools and calculators, click through to find out more about the tool, view examples of the tool on partners’ sites, and to download the embed code for any tools you wish to place on your website. The embed code can be pasted directly into the body of your webpage but if you have any problems please get in touch with the partnerships team. • Are money worries affecting your health? 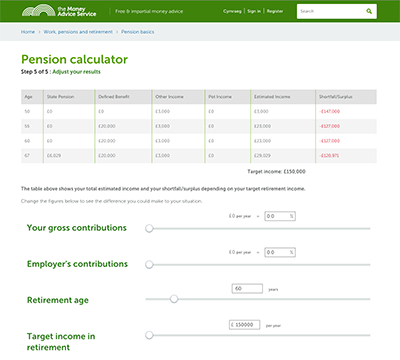 This tool helps users work out what income they may have when they reach retirement. The Budget Planner helps users track their income and outgoings. It also helps them plan for unexpected bills. Tells users how much they can afford to borrow to buy a home. Some of our tools are available in english and welsh. Loan calculator helps to visualize the monthly cost of one or several loans and will output a date from which you will become debt free. This tool helps to guide how much you'd pay each month, while highlighting that the exact amount will depend on mortgage type and lender. This tool provides cheaper and lower risk alternatives to a Payday loan and gives some advice on how to tackle money problems. Calculate how long it will take to save a specific amount, or how much you need to save to have enough by a particular date. 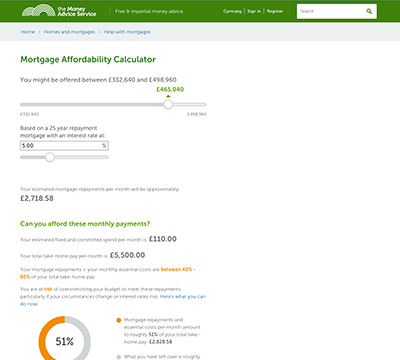 This tools helps users to estimate the monthly mortgage repayments and how much they will be likely to borrow. This calculator will help you work out how much Stamp Duty you'll need to pay on your new home. This baby money timeline is personalised to your due date and lists all of the money-related events to do with your pregnancy and new baby. This tool helps estimate how much a credit card will cost you or how quickly you can pay off your existing cards. This tool provides free, confidential help and debt advice services across the UK. This tool helps understand your level of debt and provides useful information on how to keep your finances on track. This calculator gives an estimate of the income you’ll get when you retire.